We know that Disney is planning three Star Wars spin-off films. So far, only the Han Solo movie is confirmed, with Alden Ehrenreich taking centre stage as the scruffy smuggler alongside Donald Glover's rogueish Lando Calrissian. But who will the other two movies focus on? Both Boba Fett and Yoda have been suggested, but I’d argue that there’s another, more deserving Star Wars subject who deserves his own film. For a central character, the Star Wars cinematic universe tells us nothing about Obi-Wan Kenobi. 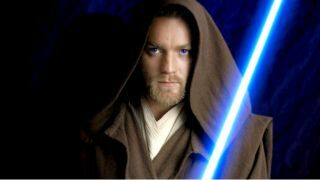 But he could be about to get his due, as apparently Stephen Daldry is in early talks to direct a movie centred around good ol' Obi-Wan. The prequels reveal little we didn’t already know, instead using him as a device for explaining aggressively bland characters. That’s why I look at this statue and want to know more. The Ben Kenobi ‘Exile’ statue is a tie-in product from Sideshow collectibles, designed with ‘encouragement’ from Lucasfilm. It’s part of the Star Wars Mythos line - sculpts which put a unique spin on familiar Star Wars characters, offering a fresh interpretation outside the established Star Wars canon. Unfortunately, it’s long sold out, but you can get a life sized Yoda for $2500. I love it. There’s more story in his backpack than all three prequels. He’s got sand in his robes more provocative than the romance between Anakin and Padme. And then there’s the face - well, faces - which are furrowed effigies of repressed memories and crushing regret. Okay. Deep breaths. I realise I’m getting animated about a statue - a statue! - but to me it represents possibility. A polystone snapshot of the wonderful, enigmatic potential of a standalone Obi-Wan spin-off. It’s a prospect which excites me far more than a similar exploration of Han Solo or Boba Fett, and *whispers* maybe even Rogue One. I might be alone in wanting a movie about a 45-year-old Jedi creaking around the Jundland Wastes, so Disney would need a sharp way of selling it to audiences. Both Rogue One and The Force Awakens do an excellent job of making Star Wars relevant to a diverse, younger audience, and I’d absolutely want a Kenobi movie could do the same. The setting and scale don’t bother me, as long as I’m learning about Old Ben. It also fits into the universe established in The Force Awakens - or at least, I hope it does. My favourite theory about Episode 7 suggests Rey is actually the great-granddaughter of Obi-Wan, rather than a Skywalker. We’ve talked about it before, but let’s reiterate because just typing it makes my fingers happy. After Obi-Wan leaves Luke with Owen and Beru at the end of Revenge of the Sith, he has 20ish years to kill on the parched sands of Tatooine. I’m not a sitting-in-caves expert, but if he spent that entire time in a Jedi pothole, he’d be a prancing, toothless vagabond by the time Luke appeared in A New Hope. Instead, he’s an erudite, capable Sir Alec Guinness. He must have been doing something. That’s plenty of time for an Obi-Wan solo adventure, and the Mythos figurine provides a tangible suggestion about what form that adventure could take. Kenobi doesn’t discuss his past in A New Hope, but that doesn’t mean he spent two decades crouching in a grotto. There are flashes of information in the comics - he relinquishes use of his lightsaber, and saves an eight-year-old Luke from Jabba the Hutt’s thugs - but the films are no longer constrained by the expanded universe. Perhaps some family tragedy drove him back to solitude? Or perhaps his own movie could see him finally find peace. By the end of Revenge of the Sith, he’s lost everything. His master is long dead, he left his own maimed apprentice to burn and he’s forced to abandon the last hope of the destroyed Jedi Order. It’s a bleak starting point for a spin-off, but one that leaves room for a powerful story of redemption. There’s also a pleasing symmetry to it all. In The Force Awakens, Rey returns to Luke the same lightsaber Obi-Wan kept all those years. Wouldn’t it be cool if both Kenobis were doing the same thing, years apart? Assuming the Kenobi theory is correct, there’s also a parallel with The Empire Strikes Back. The easy explanation is that Luke is Rey’s father, but it’s too obvious. It has to be misdirection. Instead, imagine the revelation in Episode 8 that Skywalker isn’t Rey’s father. Flip the finale of Empire, and hang the emotional climax on the idea that Rey hasn’t found her family. Perhaps Luke could hide the truth from Rey to protect her, just as Obi-Wan did to him. As Lucas himself might say, ‘it’s like poetry… it rhymes’. Only this time, he’d actually be right. The most well-documented hint takes place during Rey’s flashback. We hear the voices of both Ewan McGregor and Alec Guinness. It would be a moving, thoroughly Star Wars twist if the closest Rey ever came to the family was the very thing she rejected. It’s also telling that Rey is one of the few British voices in Star Wars. Other British actors, such as John Boyega, perform with American accents. Unless we consider the possibility she’s related to the Grand Moff Tarkin - and I’m not, because it’s deeply unpleasant and ruins my argument - her connection to Kenobi is the most effortless one to make. More than anything, it’s just more interesting - Kenobis are to Skywalkers what lightsabers are to blasters. Elegant. Civilized. Of course, there’s every chance Rey’s not related to anyone - Daisy Ridley has said so much herself - but that seems contrary to the spirit of the movies. Star Wars is a family drama, narrow in focus but wide in its sweep. A big reveal in Episode 8 would set the scene for an Obi-Wan spin-off, and tie everything together handsomely. Best of all, McGregor himself is interested. In a Collider interview with Steve Weintraub, McGregor revealed his interest in a spin-off. ”I’d very much like to do one too. I think the story between Episode 3 and Episode 4, I think there’s a story there. I think that’s the Obi-Wan Kenobi movie, if there is one.” All of this might feel like hopeful speculation, but there’s a suggestion McGregor has already been in talks with Lucasfilm. When asked if he met with Lucasfilm head Kathleen Kennedy, McGregor said: “I’m not sure I’m at liberty to say, really, but I’m very interested in doing that. That would be great.” If he hadn’t met her, why hide it? It’s frustrating that a talented actor only got to portray Obi-Wan in the weakest movies of the series. He embraces the role by Revenge of the Sith, but by then it’s too late. The numbing effect of endless green screen corridors and farting exposition robbed us of a valuable backstory. Instead of a nuanced, engaging history, we get CG diners and death sticks. Smarter people than me have explained why it’s such thunderous dogshit, but the short version is that both McGregor and Obi-Wan deserve better. Now that he’s the right age to play Ben Kenobi, it’s time to deliver. Embrace the mystery of that Mythos statue, and give us a movie that reveals the real Obi-Wan Kenobi.